Elise Thompson received an MFA from Florida State University and is relocating her practice from Tallahassee, Florida to Brooklyn, NY in February 2019. 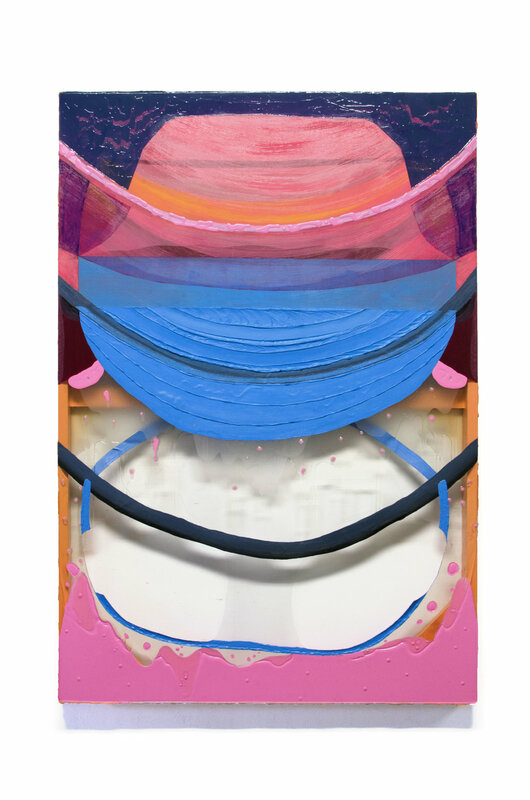 In this interview, she speaks to guest juror Taylor O. Thomas about her interest in nostalgia, use of non traditional material, and how she investigates the human psyche through color and plasticity. TT: What aspects of your background, whether art-related or not, have informed your current practice and materials? ET: I didn’t jump right into visual art. Before I committed, I was a competitive figure skater and dancer. I also did improv and musical theatre on top of all of the athletics. During the 8th grade and half of 9th grade, I was even homeschooled to train full time as a figure skater when I suffered a back injury thanks to several growth spurts, wear and tear, etc. I grew really tall, very fast! I did, however, obsessively draw as a kid for hours a day begging friends to “draw with me for fun”, but it wasn’t really an activity others wanted to do for long. It was always something I did when I had down time. The immediacy of drawing was always appealing, but the fluid and sumptuous textures of paint was what really got me later on. In figure skating, there are no straight lines. It’s nearly impossible unless you glide on a flat edge, and no one wants that. Apparel in skating and dance is always (if done right) made with 4-way stretch fabrics in diverse textures, cheesy/elegant, flair, varying in opacities. When playing an improvisation game in acting, you’re constantly building on what was added to the scene by the last person with no opportunity to say “no” but only “yes, and..”. Curves, organic gestures and shapes are always present in my work. My stretched surfaces include chiffon, glitter/glass beads, frosted plastics that emulate, at times, ice. But intuitive, improvisational moves on top of a framework set ahead of time is the crux of how these paintings are made. There’s a sense of danger with acrylic mediums on sheer surfaces. Many moves I make cannot be undone, can’t be told “no”, they can only be covered with more material or revealed again by cutting away. Every “mistake” must be part of the work by either including it intentionally or negating it eloquently (if possible!). There are often many physical layers accumulating on the front and back of the surface. Recently, I’ve been trying to be more mindful of what to cover and what to leave transparent. I make paintings, they are things, objects. I feel strongly that my performance background feeds the way I make them. Many of these things are cyclical, and it’s comforting, and a little unsettling, how often the past connects with my present. TT: You’ve mentioned experiencing an array of differing cities and circumstances throughout your educational and professional practice; how have your changing environments affected your paintings? ET: In undergrad in NKY (more Midwest than the South), my peers and I were all making traditional, oil on canvas, figurative work. I wanted make dreamy, cool and muted tableaus hinting at interior, psychological relationships between other people and myself. I graduated with a figurative body of work. I continued painting for a few years in between undergrad and graduate school, and even attended open figure sessions to hone my observational skills. I applied to graduate school with all of those paintings a few years later. Looking at the portfolio alone, it probably looked like I was a painter who wanted to make representational work, however, my letter of intent to every school said the complete opposite. The more I practiced, the more I realized how much more interested I was in process and materials. Layering up the surface, sanding and scraping it down, then building it up again. The figures became secondary; almost an excuse to just play with paint. Grad school, in FL, was when I really departed from representation The painting faculty there is diverse, and I felt encouraged to do it, but I was also ready to try something new. I still love the figure. It’s often surprising how much I still look at figurative work past and present. While the images in my paintings are abstract, I don’t think I could ever fully divorce myself from the work I’ve done. The materials and the way I use paint for have changed, the color palette is more jeweled, even cartoonish by comparison, and the way I “build” with paint is much different. I see connections; I’m still interested in the psychological ideas behind concealing, revealing, disclosure, the building up of layers, etc. The process is now just more integral to the paintings rather than the emphasis on a representational image telling the story. Florida, in general, also really affected my color palette, and I didn’t even notice it in the beginning. It was a slow creep, but I welcomed the shift. Working in dusty, dirty warehouses in the Midwest made my paintings look old, weathered and overcast. Florida brought in the nostalgia of all those pastel pinks and greens..even neon; the branding of “the beach” really did a number on me! I’ve always loved color, I’m not sure what I was so afraid of. Maybe my Midwestern sensibilities needed some shaking up. TT: Your work has always straddled the line between painting and object. What first drew you to toying with this “edge” of painting, and how do you describe your work from a formal standpoint now? ET: I took a class my first semester of grad school where we were prompted to make a work consisting of one full gallon of latex paint. Sort of like the Baldessari class assignments list. I just started pouring paint onto glass I found, peeled it up, and used the paint like a sculptural material. After that, and many, “Have you hear of Lynda Benglis?” questions, discovering Post-Minimalism/Eccentric Abstraction, and so on, I started using paint as a sculptural material more and more. I was pouring sheets, draping and covering things around my studio, wrapping objects, hanging paint from the ceiling, in trees, over stretchers, wearing them, hiding under them, piling them up, stringing them up in clusters, you name it. I wanted to totally depart from a narrative image and look at the stuff that made the flat, two-dimensional picture as something else. Not a totally new idea, but it was something I hadn’t done before. I started pairing the “paint skins” with plywood sculptures I cut into organic shapes on a band saw. I wanted to make..sculpture all of the sudden. I got a B in sculpture in undergrad, so maybe I had a tiny axe to grind. The irony was that I was still making figurative work; I was just coming at it from a new angle. I started to become frustrated with how fragile and “one use” paint skins were. I felt like I was making all of this stuff, and I was sort of wasting it. I eventually came back to the painting frame. I missed the stability, the tidiness, the formal “window”. I like shrinking away from the sides, but also spilling over the edges. The frame sort of represents “the limit”, and I found that I needed that foundation. Exploding paint off of the substrate didn’t offer me enough constraints apart from the material’s own fragile limit (something I still think about with a different body of work consisting of paint nets!). I really enjoyed the way paint looked on plastic sheeting. Plastic sheeting looked like clear medium when covered with acrylic. The problem, and joy of plastic sheeting, was that paint peels off really easily. Not a great feature when you want the paint to stay. I found chiffon at Joann Fabrics; it reminded me of those skating and dance costumes, and after seeing other artists use sheer surfaces, I thought, “Why not?” Chiffon is really fun, because it’s screen-like. The paint sits on top, but it also pushes through to the other side. There are some really interesting optical effects that happen when you look at painted chiffon from the side (the paint is so opaque! ), walk to the front (transparent again! ), then to the other side (crazy opaque). It messes with your eyes. I eventually found clear vinyl, also at Joann Fabrics. Most of want I use is pretty accessible. Clear vinyl is a cheap replacement for windows, and often a protective surface for your furniture or tables, which makes the use of it even better. It acts like a transparent, protective membrane; plastic like paint, clear like glass. For some reason, acrylic paint really fuses to clear vinyl (PVC), something I was not expecting. Even if you lay a paint skin (dry) on vinyl, it will eventually glue itself to the surface and will be almost impossible to remove. I love the way paint can float on top of clear vinyl. It became my answer to wanting to keep the emphasis on the material of paint while also letting it be supported by something not unlike itself. I can apply material to both sides of the vinyl, which diversifies my gestures, and the transparent, subtle layers are very visible when lit properly. I like toying with the edge of painting, because it’s part of my sense of humor. It’s also an aspect of my personality to “poke the bear”. My studio landlord in Florida once visited, looked at my recent work, and asked, “Is it a painting or is it something else?” That sort of question really excites me. Work that makes you ask questions is exciting! You don’t have all the answers, and I love that ambiguity. I started experimenting with paint as an object, because I wanted to see if I could make a painting wasn’t just a picture. I thought whatever I was trying to talk about with my figurative paintings could be articulated another way. I also wanted to get people to look longer, to move around the work, search through it. With transparent surfaces, I can layer on top, make moves below, and uncover parts that are in between. The paintings aren’t necessarily portraits, but I am thinking about how we present ourselves publicly; what we choose to mute, share, and the idea that people can diffuse the truth. I’m covering areas, frosting surfaces to make what is beneath harder to read, and physically cutting away at the surface to reveal what was hidden. All of these procedures are very human examples of communication “clear or muted”. The work is still about relationships. Whoops, I’m so predictable! TT: How do you begin a piece, and what does your painting process look like? ET: Recently, I’ve been much better about sketching before hand. I used to just tackle the surface without a plan, and I’d go too far. The painting would look like 8 different paintings in one. The sketches are on paper, and are not overly specific. They leave a lot of room for intuitive improvisation, which I need so that I can even surprise myself during the making. Sometimes, moves just happen, and you didn’t anticipate them, but you have to make do. Sometimes “making do” is really sweet. As I mentioned before, many moves I make on translucent surfaces cannot be undone, they can only be covered with more material or revealed again by cutting away. Cutting away is a new gesture for me, and it resulted as an accident. I was trying to use an x-acto blade to help a strip of painters tape peel back cleaner, but I cut too far. I then proceeded to just cut the whole masked part out. One of my rules is that every “mistake” must be part of the work. If I make a mistake, and I obsessively try to work against it, it will drive me mad! “Rolling with the punches” is just another poetic procedure I’ve adopted. Another starting point for me is the frame. I started painting them so that they would integrate into the “image” more seamlessly while also being an obvious architectural element. The frame can be a basic rectangle, but sometimes I’ll make frames with many structurally unnecessary cross bars, which is when, again, the paintings cross over into something else. Perhaps furniture. I do also tend to anthropomorphize my work. Don’t get me wrong, I know that they are still “paintings”. None of this is magic, and I’m not trying to fool anyone that they aren’t. But! I’d like to think that there are things going on in the paintings that playfully comment on their penchant for side stepping into the third dimension. Most of my “moves” are loaded conceptually. TT: You have spoken at length on your interest in “cultural ghosts” and nostalgia; could you expand on your relationship (and your work’s relationship) to these aspects of our society? ET: Before I was 13, And I’m not totally proud of this, I would only watch Cartoon Network (when you had to switch over to B on your cable box), Nickelodeon, Disney, and Don Bluth films. I also ate too many Gushers, Fruit Roll Ups, Fruit By The Foots, you get the idea. It may seem topical and silly, but watching this content, eating these foods, being inundated with Nickelodeon slime footage and advertising was what everyone fears: formative. Speaking from a color palette standpoint, children’s animation and marketing for 90s foods “made for kids” is what I’m looking back on lately. I love pouring over sample palettes for cartoons and animation to see how the colors can be limited, vibrant, maximal, but somehow very cohesive. I’m drawn to this garish overall tone in many shows that is simultaneously abrasive and satisfying. Once, a friend walked into my studio, and the first thing she said was, “It looks like The Simpsons exploded in here.” I’m a sucker for first impression comments when people enter the room. They’re honest. I was a bit too young to fully embrace The Simpsons as a kid, but now fully aware of how it persists as a cultural behemoth even if its “Golden Age” has passed. Not just as a style in animation e.g. heavy line work, bulging eyes, limited palette (apparently, when the show started, a typical animated series consisted of 1000 colors, whereas The Simpsons comprised of just 200). The look of the show was a trojan horse; it looked like a kids show, but the writer’s intentions utilized this “language of insubordination” to attempt to get viewers to mistrust authority (borrowing this from Chris Turner’s “Planet Simpsons: How a Cartoon Masterpiece Documented an Era and Defined a Generation). Themes in the show, are of course, mature. Many animated series, movies, etc. have borrowed from The Simpsons, which is what you do when you want to be in the conversation and add to it. These things seem shallow to some, but you can’t ignore how these forms of entertainment are absorbed culturally and become embedded in how we see the world. Sometimes you’re quoting The Simpsons, and you don’t even know you’re doing it. It’s been embedded in you too, and they are like ghosts that haunt you. Ghosts have the potential to stay with you, color your memories, and your associations to those signifiers. Sometimes a color or texture opens up a nonlinear worm hole in your head and connections fuse; some make sense and others never will. One of my intentions is to play with the formal qualities of those potential connections to jog your memory, but still keep you off base. I’m pointing to references all the time, but they aren’t explicit, because I never want to tell people exactly want to do, what to see, what to think. I do, however, lightly guide the viewer with several hints to see where it leads them. Often, the “read” of the work is somewhat unanimous. I mention pointing to “the familiar” a great deal. There’s a warm, but slightly uncomfortable feeling when you’re reminded of something you can’t put your finger on. Nostalgia does that for me. It can be sweet but can be an equally uncomfortable ache. TT: Though your paintings demonstrate an obvious draw to artificial color and plasticity, your titles and materials also suggest a deep investigation into the human psyche. Can you discuss how and why these two seemingly opposing qualities come together in your work? ET: Yes, I mentioned before that the procedures and processes I follow feed into ideas on self-disclosure and communication. The works can be seen as psychological portraits, though lately they are beginning to reference landscape, specially the openings of caves or portals. I also see these as “mouths” into a place, that place being the interior of a person or self. Again, people put up protective walls, they can choose to not divulge everything, shield parts of themselves by withholding what they’d rather not expose as a precautionary measure. I think about restraint and indulgence, vulnerability and desire. In short, translucent materials and layers speak to the idea of transparency regarding information. Harking back to the clear vinyl, it’s a protective membrane acting as a window which can shield but show you what’s underneath, be frosted or callused with more layered material to obstruct, or be cut away completely to reveal again. TT: At quick glance, your paintings could easily be described as ones that sing of bubble gum colors, sensual surfaces, and yummy constructions. But upon further investigation, one may notice the “wrenches” that have been intentionally hurled into the works– an unsetting bulge, a gross palette addition, a texture that doesn’t sit with the rest. What is your hope for a viewer’s interaction with your work, and why do these “wrenches” matter? ET: Yes, this related to one of the above question, so I’ll just keep going! I mentioned the “Trojan Horse” aspect regarding The Simpson’s; an initial impression could be its a juvenile kids show, but the content inundates the viewer with satirical commentary on adult themes. This isn’t the only cartoon to do this, just watch a Don Bluth movie from the 80s, like Rockadoodle or All Dogs Go To Heaven, and prepare to be disturbed as an adult! Perhaps it’s to appeal to a wider age range, but I remember watching these movies as a kid, loving them, but being subtlety aware of the other messages that were being relayed. These films are beautifully rendered, harmoniously painted, appealing to children, but there is the ever present acknowledgment of a dark maelstrom underneath it all. I want to make good paintings. I want the viewer’s eye to rove, to feel satiated, pleased, but not without a few hiccups along the way. I will intentionally throw in absurd textures and awkward moments into a work to disrupt a seemingly nice image to halt an easy viewing of a pretty thing. I want the viewer to stop, look longer, ask questions, feel uncertain, maybe even laugh. Nothing is perfect, proverbial wretches are real, and I often ask myself, “Is perfection really desired?” So, “The Wrench” is another way I can visually reference the very relatable circumstance where things are not perfect, there are always disruptions, and they can’t easily be ignored. TT: How do you recharge? ET: When I lived in Florida, I would drive to the beach and float in the Gulf for hours! That was a safe place (save for stinging sea life on purple flag days). Alternatively, if there’s no where to float or tread, I take what I call “suburban mom walks” while listening to podcasts and audiobooks. Some to do with art, some not at all, but I find relative threads. It can be a good break for my head to listen to something totally different to decompress from the studio. I also started making sourdough a little over a year ago thanks to artist Leah Guadagnoli gifting me sourdough starter during my time at The Maple Terrace Artist Residency Program in Brooklyn! I got the starter, and then taught myself how to do it. It’s really meditative, there’s always the reward of delicious food, and it makes me feel connected to a larger legacy. When a loaf turns out, I feel pretty proud of myself! It’s laborious, but worth it. I love food in general; talking about it, making it, and eating it. I joke all the time that “Art, but food is #1”. I think if I hadn’t become an artist, I would have a career as a baker or something to do with food. Can I host a food competition show? Please? TT: What is one thing you’re hoping to do, believe, or carry into 2019? ET: I want to keep moving forward; push myself even when I’m hesitant or insecure. I wrestle with a lot of self-doubt and insecurities involving what I’m capable of and I’m worth. I, like many of us, am my own worst critic. I want to keep making and keep pursuing my practice. A couple of years ago, I made a commitment to myself to go “all in” with my studio work, so if I can consistently keep going, that’s a win for me.